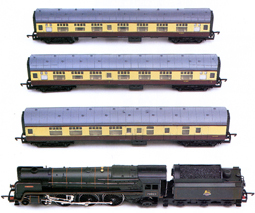 Information: Mixed traffic Class 7 Britannia locomotives were built between 1951 and 1954 as the final British Railways standard design. One member of the class 70013 Oliver Cromwell has the distinction of being the last official steam locomotive to haul a revenue train on August 11, 1968. Details: Class 7 Pacific locomotives were conceived by the fledgling British Railways as a result of the 1948 locomotive exchange trials. The design was intended to replace many out-dated steam locomotives on all Regions of the newly formed British Railways. Design took place at the British Railways Engineering Department in Derby under the tutelage of Robert A. Riddles . Ultimately, 55-locomotives were produced in three separate batches; all at the British Railways workshops in Crewe. The first batch (70000-70024) consisted of 15-members allocated to the Eastern Region, eight for the Western Region, and two for the London Midland Region. All entered service in 1951. The second batch, (70025-70044) were produced between 1952 and 1953. The final batch, (70045-70054) were built in 1954. This last batch; all allocated to the London Midland Region used a modified tender featuring a steam powered mechanical coal pusher to allow longer runs over the extensive West Coast mainline making the later machines easily discernable from previous batches. 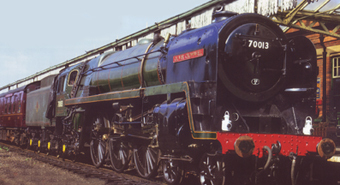 The class; most of which were named after prominent historic British figures were all painted lined Brunswick Green, although the class leader 70000 Britannia was originally turned out in mixed traffic black. 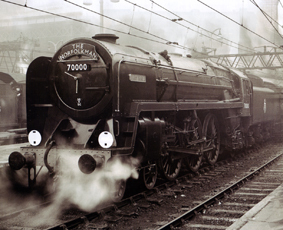 Several of the original Western allocated locomotives were given former GW Star class locomotive names, whilst the final batch got named after Scottish Firths. Curiously one member of the final batch, 70047 never received a name. In theory the Class 7 locomotive was to be the most versatile locomotive ever designed in Britain. It was designed as a light-weight 4-6-2 Pacific capable of high speed operation, wide route availability, low capital expenditure, and with low operating and maintenance costs. The simple two cylinder design gave the Pacific the notoriety of being rough riders and prone to slippage on acceleration or on steep inclines. For this reason they were not accepted by the Western Region and other than a small allocation to Cardiff, where they were indeed accepted, most were transferred to duties on the Eastern. The entire Class eventually dispersed over the entire British Railways network. They were rostered for all forms of duty, from humble freight and parcels through prestigious named passenger train runnings, which included Golden Arrow, Red Dragon, Bournemouth Belle, Irish Mail, and Master Cutler. Not with-out problems; with many being resolved between batch production the class led woe-fully short working lives with the first member of the class 70007 Coeur de Lion being with-drawn in June 1965. The final member with-drawn, 70013 Oliver Cromwell has the distinction of hauling the last revenue British Railways passenger train; the 15-Guinea Special on August 11, 1968. Two members have been preserved, class leader 70000 Britannia and 70013 Oliver Cromwell.